Saturday of Oysterfest, Abigail brought a box of goodies for me that I promised to blog about later. 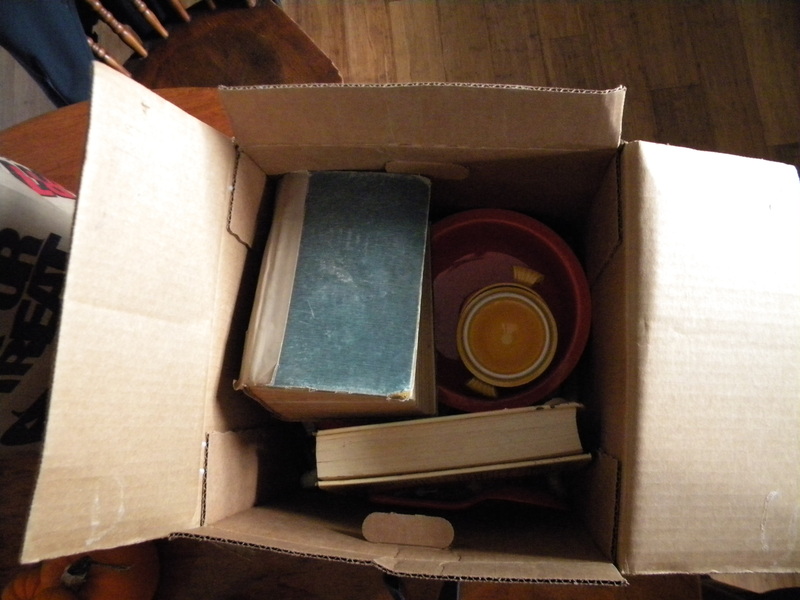 Inside the box were a number of items that belonged to her grandmother that she thought I would enjoy. Old cookbooks and dishes, namely Fiesta ware, two things I seem to have a collection of. Originally published in London in 1861, “Beeton’s Book of Household Management” was the first of the all-purpose, must have recipe and advice book for the masses. Among the revolutionary things in this book was the use of tested recipes, each one beginning with a list of ingredients, with a standard and uniform system of weights and measures. Also included was advice on how to keep the house clean, choose friends, play hostess, shop for clothes and dress properly. It was the first comprehensive guide to running a Victorian home, an instruction manual for social climbers in the rapidly expanding English middle class. The book sold two million copies within 8 years of its initial publication, which is a huge feat for its time. I originally thought the copy Abigail had given me was from the 1930’s thanks to a note written in pencil in the beginning of the book dated Christmas 1932. One side, recipes for rabbit. On the other, listings of acts of bravery and battle for soldiers dated August of 1918,sharing their mother’s home addresses. 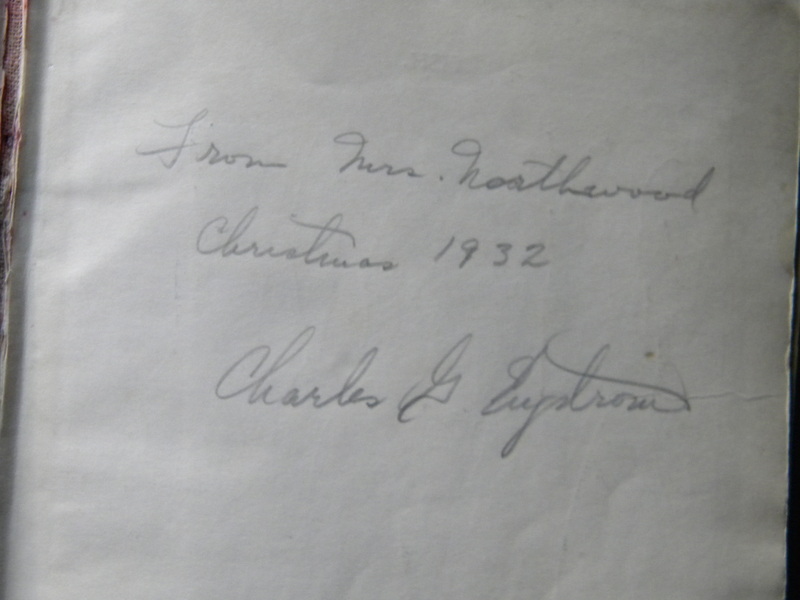 That’s when I flipped to the title page and saw the edition year – 1912. Turns out I was holding in my hands the 1912 Edition of Beeton’s Book of Household Management, which I’ve since discovered has been used by Downton Abbey as a historical culinary resource. It’s a fascinating glimpse into English kitchens of a century ago. There are recipes on just about anything and everything you can imagine – the entire British empire is covered. Have a hankering for Curried Kangaroo tail? There’s a recipe. There are gorgeous colored plates of different types of fish, game, dishes, table decorations, trays for invalids, as well as equally good black and white ones of similar nature as well as how to change sheets for the bedridden and how to bandage a head wound. In short, it covers everything one would need to know to run a household in 1912 in its 2040 pages, plus the ten or so pages of advertisements in the rear. Even more impressive is the story of Isabelle Beeton, the original author. Born in 1836, the oldest of four children, she was four when her widowed mother remarried a widower with his own four children. The couple went on to have another thirteen children together, making Isabelle the oldest of twenty one children. At the age of nine, she found herself installed in a second house on the property, where along with her maternal grandmother, she was given the responsibility of running the household. After marrying Sam Beeton, a young publisher who found his first sucess in publlishing the first British Edition of Uncle Tom’s Cabin, Isabelle joined her husband at the office, becoming the editor of the cooking and household columns of the recently launched Englishwoman’s Domestic Magazine. It was these columns that led to her book through a bid to attract interest to the magazine, by soliciting recipes from readers. Faced with an abundance of material, Isabelle tested and edited the submissions over the course of four years, first publishing them in the magazine and then the book. In the preface she writes “I must frankly own that, if I had known beforehand the labour which this book has entailed, I should have never been courageous enough to commence it.” Three short years after the publication of this book, Isabelle died shortly after giving birth at the age of 28. It’s a fascinating book, with an equally fascinating history. Apparently it is still in print, although like Irma (Joy of Cooking) and Betty (Crocker), it has been updated over the years so that a modern edition would not have the same character or charm that the 1912 edition has. Also in the box of goodies was a 1965 Fannie Farmer Cookbook. I first discovered The Fannie Farmer Cookbook in college, when I had a roommate who decided he was going to be serious about cooking and so brought home the cookbook. I remember pouring over it with my friend Sheilah, where we were amazed there were recipes for things like brains on toast, to be served on triangles of warm, dry toast. I have since acquired for myself a 2003 edition and Sheilah gifted me a 1957 edition of “The Fannie Farmer Junior Cookbook” several years ago. The Fannie Farmer Cookbook began in 1896 as The Boston Cooking-School Cook Book written by Fannie Farmer. Miss Farmer was at the time, the principal of the Boston Cooking School, having studied there. Called the ‘mother of all level measurements’, Farmer brought the concepts of standardized measurements to this country and insisted they be ‘level’. She provided scientific explanations of chemical reactions in cooking, hoping to “awaken an interest through its condensed scientific knowledge which will lead to deeper thought and broader study of what to eat”. The book also offered household management hints. The cookbook was not expected to do well initially by the publisher, but went on to become the best selling cookbook of its era. It is still in print today although it has seen its name changed from The Boston Cooking-School Cook Book to just The Fannie Farmer Cookbook while undergoing changes by a number of editors over course of the last century. Interestingly enough, as I was searching the internet for information on the history of The Fannie Farmer Cookbook, I came upon this letter from Robert H. Fetridge of the publishing house of Little, Brown and Co., Boston in response to a review in the April 8, 1965 edition of The New York Review of Books by Michael Field. Complete sidetrack here – the review was for new editions of three “Gospels of American Cooking”, The Fannie Farmer Cookbook, The Joy of Cooking and The Settlement Cookbook. Not only do I happen to own copies of all three of those editions, I was fascinated by the review itself, as well as the letters sent in response. I can’t say I know when I’ve seen such thorough reviews of cookbooks. This particular copy of The Fannie Farmer Cookbook had the original price tag from The Hecht Co., a department store I remember shopping at with my grandmothers. It is also my now second cookbook published after 1950 that references a citron melon recipe. There are handrawn illustrations by Alison Mason Kingsbury reminiscent of Joan Walsh Anglund illustrations. While this edition no longer offers household management tips, it does offer suggestions for simplified entertaining for the busy hostess. It also has brains recipes, although mention of the specific warm, dry triangles of toast it is to be served with is no where to be found. I could spend hours talking about the history of both these cookbooks as well as the numerous rabbit holes I fell down while learning more about them. 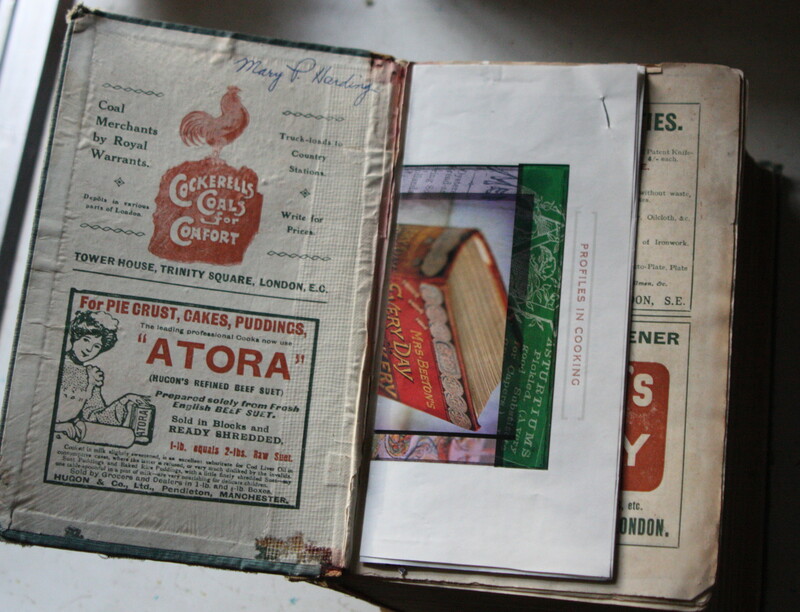 I love collecting old cookbooks to see the history of food, cooking and household management as well as the changes over the years, particularly for cookbooks originally printed decades and even centuries ago. Thank you for sharing these with me Abigail. I haven’t forgotten the Fiesta ware which rightly deserve their own post. You received a box of awesome; what cool books! It really was a box of awesome! Part two is coming soon. What grand culinary treasures! You’ve done them proud with this well illustrated post. Thanks. The history in each of these is CHARMING stuff! And I adore finding bits tucked in between the pages of an old book. Indeed! Also tucked into the book was an undated newspaper clipping on Mrs Beeton that mentions a recently published biography written by her granddaughter. I cannot find any reference to this book anywhere else, which is in part why I didn’t mention it, but I did discover there was a biography written by a grand-niece in 1948. On the backside of the article is a portion of a Wanamaker’s ad for nylons with ‘the new tapered heel’ for $1.95. Wow. Absolutely amazing! What treasures! Also, I had no idea that’s how a wedding cake is cut (looking at one of the pictures). Total treasures! And yes, there is an art to cutting a large, tiered cake. I love old cookbooks! I had wanted a copy of Mrs. Beeton’s and I found one randomly in an antique shop when I was in Cape Town, so I bought it. I think mine is from the 1930s or 1940s. I haven’t had a chance to really read it yet. Enjoy yours! I’d love to take a gander at it sometime! 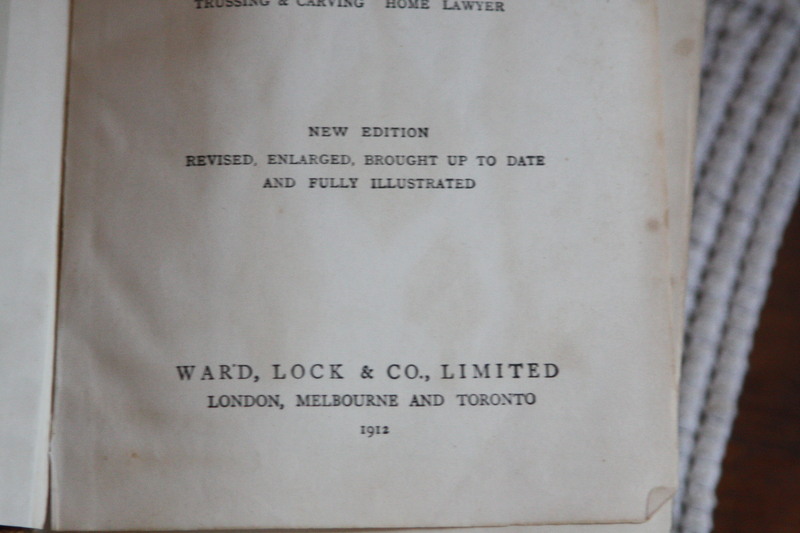 The writers use a later edition – the one I have, the 1912 edition, as the original was published in 1861. I’ve read it doesn’t necessarily have the best recipes, but that it is an interesting time capsule. Which it definitely is.